Farming is one of the most tangible professions there is. The product of a farmer’s labor is apparent at the end of every work day, with ripening tomatoes on the vine or gallons of milk in the fridge. Policy, on the other hand, is often the opposite: a handful of law makers gathering in an air conditioned room turning concepts into law. So for farmers, when does policy become tangible? As we learned last month with the failure of the Farm Bill in the House, policy has a wide-reaching effect on farmers. Beginning farmer education programs, conservation cost-shares and affordable loans are just some of the tangible outcomes of policy for which NYFC is fighting that remain stuck in limbo while Congress decides what’s next for the Farm Bill. But the Farm Bill is not the only piece of legislation with tangible effects on our farms and ranches. States and regions, such as the seven Colorado River basin states, are constantly working with policy that matters to farmers. And with another year of harsh drought in the west—and looming predictions of water shortage—much of that policy is focused on water. On July 16th the Senate Water and Power Subcommittee will host a hearing on the Colorado River Basin Supply and Demand Study, the primary “call-to-action” for matching water supply with demand in the Basin. At the state-level, Colorado water policy is opening doors to more flexible water use for farmers and conservationists alike. Last year, when the Yampa River nearly ran dry, an innovative water leasing program allowed the Colorado Water Trust to lease water for in-stream flows, benefiting both fish and farmers downstream of the imperiled reach. Additionally, state Senator Gail Schwartz is developing legislation that will incentivize conservation for farmers. It is a time of change, and our voice matters. If policy ever feels like an enigma to you, just look out on your nearest river or stream. We have the power to protect these vital resources, and are doing so as a growing unified voice. NYFC is working with Congress, states, and other organizations to ensure a healthy future for farms and rivers both. We are keeping the pulse on the above policy developments. 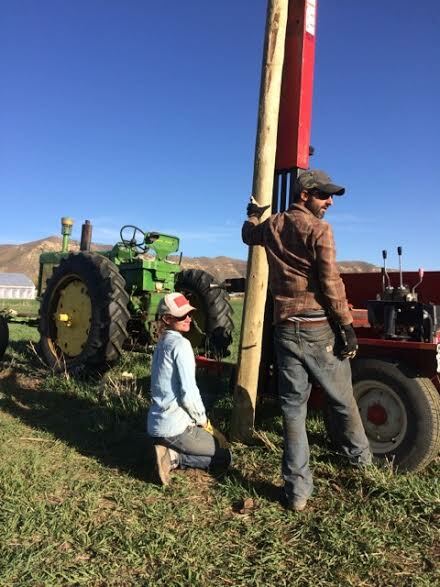 We are also showing our decision makers that young farmers care about our rivers with two upcoming campaigns: the Colorado River Farmers Pledge and a string of west-wide events for Colorado River Day on July 25th. Look out for more details to come on these campaigns. And in the meantime, keep enjoying those mid-summer tomatoes! « previous article: What's going on with the Farm Bill?